*Online registration is now closed. 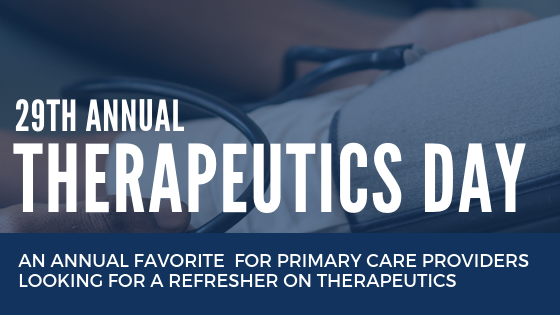 If you are interested in attending the 29th Annual Therapeutics Day program you are welcome to register at the door on Wednesday. At the end of this program participants will be able to cite evidence-based therapies and explain appropriate management around prominent areas of primary care concern. Participants will be able to discern if their current knowledge contains myths that may have been surreptitiously living in the world of medicine. This Group Learning program meets the certification criteria of the College of Family Physicians of Canada and has been certified by Queen’s University for up to 6 Mainpro+ credits. This event is an Accredited Group Learning Activity (Section 1) as defined by the Maintenance of Certification program of The Royal College of Physicians and Surgeons of Canada, and is approved by the Office of Continuing Professional Development, Queen’s University. You may claim a maximum of 6 hours. "Infection Protection Direction: HIV & HTLV-1"
Claudio Soares, MD, PhD., FRCPC, MBA, Professor and Head of Department of Psychiatry, Queen's Univ. Michael Hendry, MD, FRCSC, FACS, Assistant Professor, Department of Surgery (Division of Plastic Surgery), Queen’s University.